Tove Jansson is the well-known author of the Moomin books, although she also wrote stories for adults. Commendable as these stories are I have to admit it’s the Moomins I return to, over and over. Not only are they wonderful stories, populated by a mix of weird and wondrous characters, but Jansson’s atmospheric black and white line illustrations also add an extra dimension. Jansson’s characters may be small creatures who don’t exist in the real world but their attributes are all too human. They are certainly not one-dimensional characters – and some are really quite odd and eccentric. There’s the lonely Groke who turns everything around her to ice, the pompous and bossy Hemulen, the fiercely independent Snufkin, the courageous and reckless Little My, the ever-curious Moomin, the shy and tremulous Sniff, and then there’s the ever present earth-mother Moominmamma, always available to comfort those in distress. But even the soothing Moominmama has another side to her personality. One day, feeling homesick, she paints a mural of Moominvalley on the lighthouse wall (Moominpappa at Sea) and vanishes inside the painting for hours. On the surface the Moomin stories appear to be about a family, and its friends and hangers-on, but Jansson writes about serious issues – our human need for love and acceptance. Loneliness. Anxiety. Loss. Uncertainty. Mortality. Toft is mad because the Moomin family aren’t home. Now, at the end of the book, as he wanders lonely and angry in the forest, he begins to understand that his view of the Moomin family and of Momminamma in particular, is idealised and unrealistic. He has grown-up. Jansson writes so beautifully about our human foibles – our need to be loved and accepted, and to love in return. 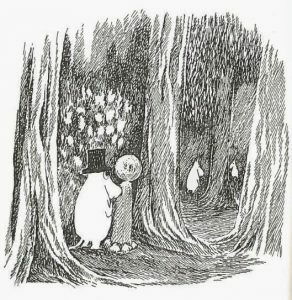 In Finn Family Moomintroll, after Moomintroll tries on the Hobgoblin’s hat, he becomes unrecognisable to his friends. ‘Your eyes are like soup-plates,’ said Sniff – ‘Moomintroll’s are small and kind.’ ‘Yes, exactly,’ Snufkin agreed. You are an imposter,’ cried the Hemulen. But Moominmamma recognises Moomintroll, and the moment she does, Moomintroll returns to his normal form. In Moominpappa at Sea Jansson writes about our need to be needed and to matter in the world. One afternoon at the end of August, Moominpappa was walking about in his garden feeling at a loss. He had no idea what to do with himself, because it seemed everything there was to be done had already been done or was being done by somebody else. He decides to take the family off on a trip to an isolated island, which gives him purpose. While the family are away a number of other creatures visit Moominvalley (including Toft mentioned above) hoping to spend time with the Moomins. But they are disappointed. The Moomins do not reappear and an assortment of odd and rather obsessive creatures have to find a way of living together in the Moomin house without the family. Moominvalley in November – the last of the Moomin series – is about loneliness and disappointment and how to cope with it. Jansson also writes about what it is like to be an outsider. 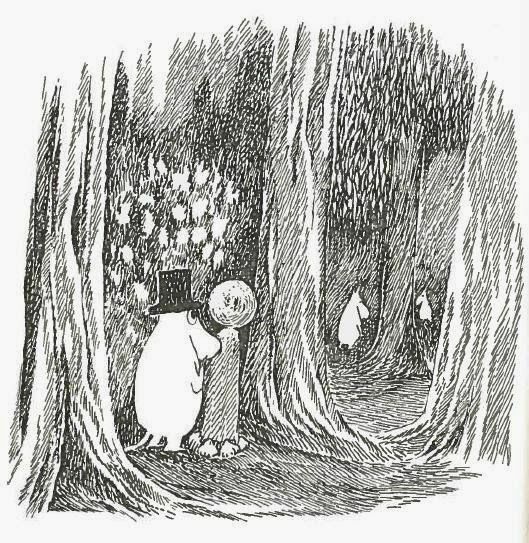 In fact most of the characters, with the exception of the Moomin family themselves are outsiders but the Moomins accept anyone with grace and kindness – except perhaps for the Groke who seems to be beyond saving. When the Muskrat appears at the door one night Moominpappa not only lets him in and offers a bed for the night but also offers him a glass of wine. Jansson’s books tell us something about our place within the universe. In Comet in Moominland the earth is about to be swallowed up by the comet. Luckily, at the last moment the comet veers off course. If it had come a tiny bit nearer to the earth I am quite sure that none of us would be here now. But it just gave a whisk of its tail and swept off to another solar system far away, and it has never been seen since. 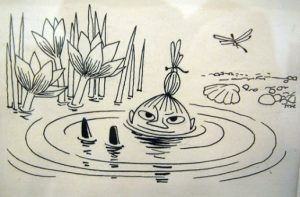 Jansson was originally a political cartoonist and her first book, The Moomins and the Great Flood, written at the end of the war, is a reminder that life can be both unpredictable and frightening. 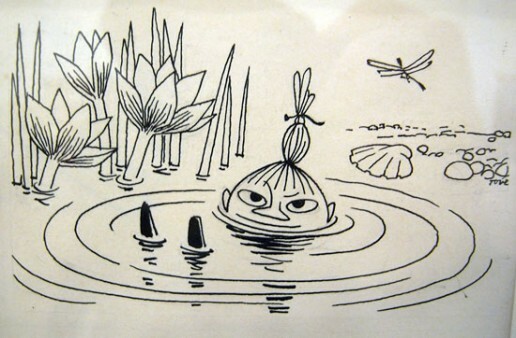 The Moomins live far away from cities – theirs is the world of the forest, the mountains and the sea. The natural world is a place of great beauty but sometimes great terror. Here is Toft again. The forest began to thin out and huge grey mountains lay in front of him. They were covered with depressions full of boggy ground right up to their peaks…up there was nothing, just the wind. The sky was vast…everything was enormous. Toft looked behind him and the valley was just an insignificant shadow below. What we can learn from Jansson is how to write about the complexity of human relations. There is humour, pathos, fear and love in her work, as well as beautiful descriptions of the natural world.